Lookin' to get some BIG AIR then look no further. 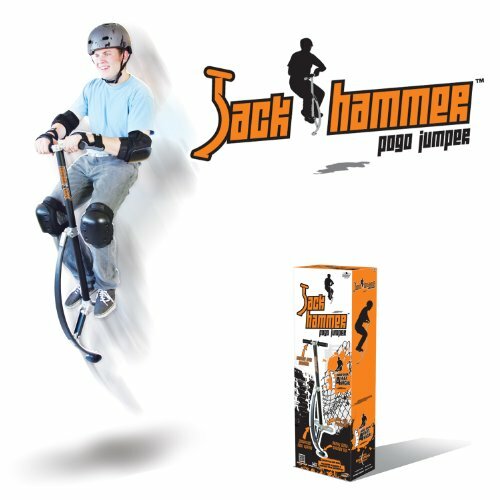 The JackHammer Pogo Jumper is like none other on the market. It uses a special bow-shaped spring made of composite fiber to propel the rider to new heights. With jumping heights up to 4 feet possible, there will be no shortage of fun on this pogo. Besides the composite fiber spring, the Pogo Jumper is made out of high-grade aluminum and weighs less than 8 lbs. Using two different sizes, the JackHammer Pogo Jumper accommodates weights from 154 to 176 pounds (70 to 80 kilograms). Jumping heights of up to 4 feet possible! Made of heavy grade aluminum and weighs only 8 lbs. Spring made of composite fiber material. Finally a pogo that bridges the gap between extreme pogos and the typical pogo! Larger size, suitable for 154-176 lbs.